Woodland Park Zoo turned a shade greener with the unveiling of new Light & Charge electric vehicle stations. The stations are the first of 20 to be installed around Seattle, representing a $1.2 million investment by ReachNow, the mobility services division of the BMW Group. Seattle is the first city in North America to receive the Light & Charge stations, which turn existing streetlights into electric vehicle (EV) charging stations. 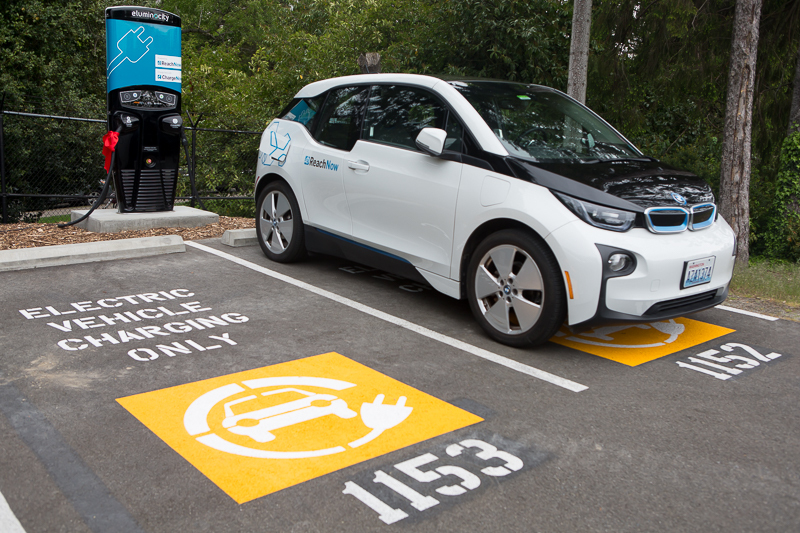 With more than 1 million annual visitors coming through Woodland Park Zoo, that’s a lot of visibility for the benefits of EVs and car sharing. ReachNow CEO Steve Banfield (left) and Woodland Park Zoo President and CEO Alejandro Grajal (right) test the new electric vehicle charging station installed on zoo grounds. Green is a color we wear well. 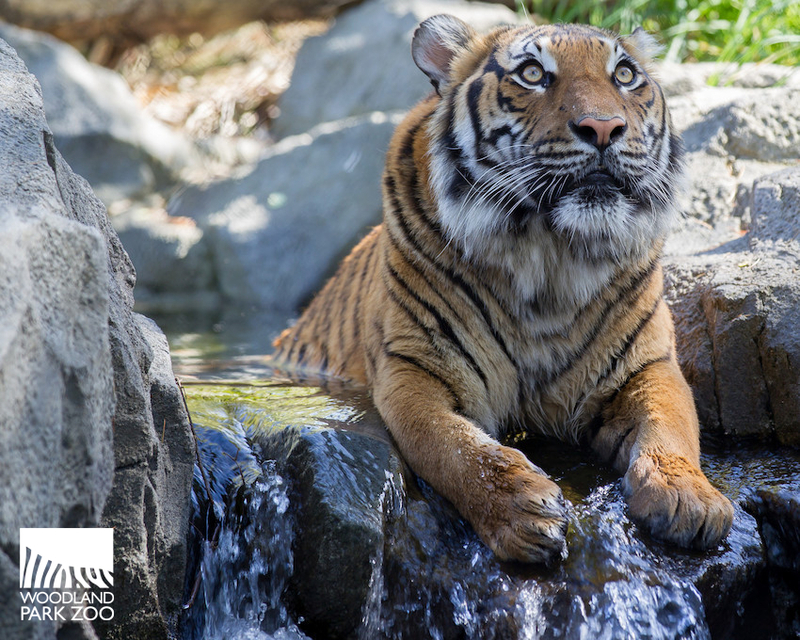 Sustainability is at the core of Woodland Park Zoo's mission to save animals and their habitats. By stewarding resources and reducing our impact we not only help wildlife, but also serve as a living classroom for others to discover sustainable practices to try at home or in their own communities. Zoomazium was the nation’s first zoo project to earn the U.S. Green Building Council’s LEED Gold (Leadership in Energy and Environmental Design), and went on to earn six local, regional and national awards. The zoo’s West Entrance was the second project at the zoo to receive LEED certification. Woodland Park Zoo is one of the leading institutions nationally on sustainable exhibit design. 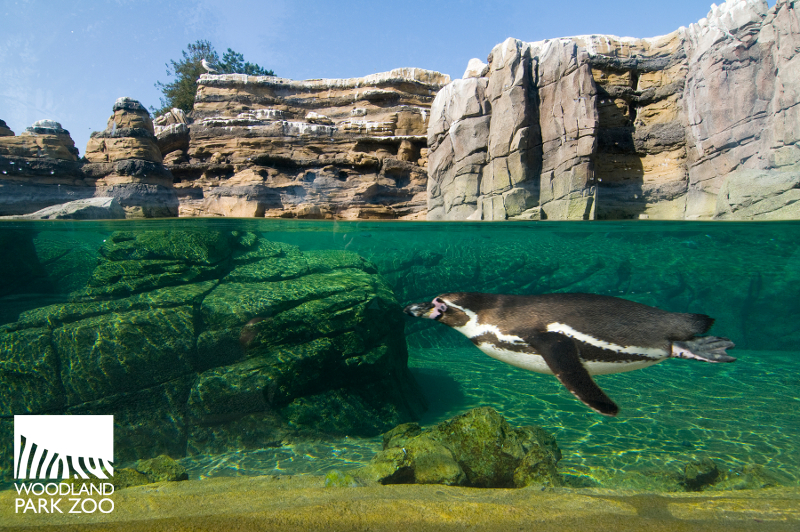 The Humboldt penguin exhibit was designed with nature in mind, built sustainably using geothermal energy and an innovative filtration system that saves 3 million gallons of water and nearly 22,000 kilowatt hours of energy—the equivalent of saving 24 million pints of drinking water, and heating five, new two-bedroom townhouses—each year! The exhibit also contains and recycles all stormwater runoff thereby helping to keep Puget Sound waterways clean. The exhibit garnered the best exhibit award from the Association of Zoos & Aquariums; the award is equivalent to an Oscar in the zoo community. Similarly, the tiger pool in Banyan Wilds uses innovative filtering techniques, water features and systems based on the principles of biomimicry by which streams and ponds are filtered naturally through constructed wetlands. All visitor pathways in the exhibit complex are made with pervious pavement. Storm water is infiltrated into the ground instead of spilling into storm drains. A rain garden is also located near the tropical aviary. In 2014, the zoo launched the largest community solar project in Washington state: Community Solar on Phinney Ridge, an innovative partnership of Woodland Park Zoo, Seattle City Light, and Phinney Neighborhood Association. 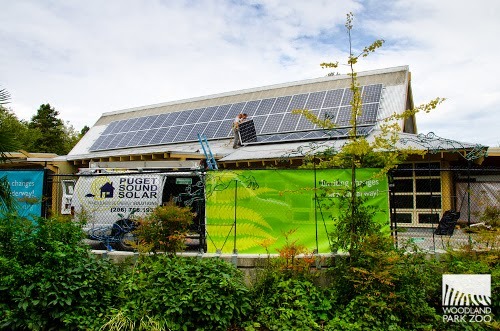 Solar panel arrays on the Rain Forest Food Pavilion and on the zoo’s behind-the-scenes animal food Commissary building enable City Light customers to purchase electricity from a renewable source right on Phinney Ridge. This project followed the installation of solar panels to the zoo’s Historic Carousel in 2011. The solar panels produce roughly 9,000 kilowatt-hours annually, enough to offset the electricity required to power the carousel, which completes an average 100,000 rides per year. In addition to exhibit design, the zoo diverts more than 700,000 pounds of waste from going into landfills each year thanks to Zoo Doo composting, saving $60,000 per year in disposal costs. The installation of Light & Charge stations around the city also marks an important milestone for the Drive Clean Seattle Initiative, which seeks to electrify the city of Seattle’s transportation and move toward carbon neutrality by 2050. The Light & Charge system, from eluminocity US Inc., transforms existing street and parking lot light poles into connected nodes on a smart city network. The system combines high-efficiency LED lighting. The stations will be available to other electric cars for fee-based charging. Happy 20th birthday to hornbill Blueberry!